Hello everyone! 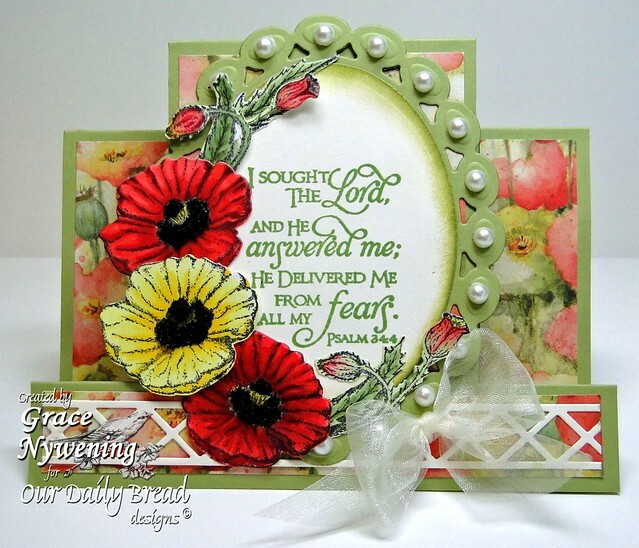 Today I have a Center Step Card Layout that I made using this month's Our Daily Bread designs release, Mother's Day, as well as Customer Favorites Scripture Series One. The base is Pear Pizzazz and the dp is K&Co (a gift from a dear friend- thanks again sweet friend!). I used my Grand Calibur to cut my Spellbinders Beaded Oval and Classic Oval Small. I used Memento Ink to stamp my poppies, then colored them and used the ODBD custom die cut to cut them out real quick! The pearls are Recollections, and I finished off the centers of the poppies with Black Ultra Fine Flower Soft. The basic pattern I used for this center step card is found here. Incy Wincy Designs - Bright and Bold, Make it Monday - Anything goes, Stamp Fairy - For the Girls with a Sentiment, Woodware USA - Die Cuts/Punches, Kenny K Krafty Girlz - Anything goes, Paper Sundaes -Texture, Pile It On - Use a rubber stamp (no digis), Copic Creations - Must use Copics, favorite paper for Copics, A Gem of a Challenge -Pearls and/or swirls, Crafty Calendar -April Showers Bring Forth May Flowers, Ellephantastic - Anything But Square or Rectangle, Card Makin' Mamas - embellish it, Inspire Me Fridays - Anything goes, Totally Papercrafts - Challenge #62: Springtime, Dutch Dare Card Challenge - Fancy folds. This is stunning. Love your card! Hello Grace .A pleasant place to visit , to be sure . Your card is as inspiring as your blog .Love the layout and all the elements there-in . Thank you for sharing and linking to Michelle's Make it Monday . Wow Grace your card is absolutely gorgeous! I have to try one of these center step cards! Thanks for playing with us at WoodwareUSA! Grace this is just stunning! This is absolutely stunning, Grace! What a wonderful design! Your poppies are gorgeous! This is stunning Grace...Gorgeous colors and those flowers are colored beautifully. Beautiful card! And of course I love the verse too. :-) Thanks for playing with us at DDCC, we really appreciate your support. Grace, this is one of the prettiest cards I have seen in a long time. Love the dp and the poppy images. Awesome job! Oh, I love this! Is that K & Company's Spring Blossom paper? I love it...beautiful color and wonderful poppies! I like how you used the black flower soft in the centers...that was a great idea. The shape of the card and that beautiful bow are so pretty and elegant... and that Scripture is so meaningful to me. It is such a great promise in His Word. Grace, you make the most beautiful cards! Have a blessed Easter! Wow, stunning! Thx for sharing your inspiration with us at Make It Monday! Hope to see you again! Oh my! you have made some beautiful cards of late. This one is beautiful. I love the poppies and love the scripture. The design of the step card is wonderful. I love the poppy design paper behind it. WOW! 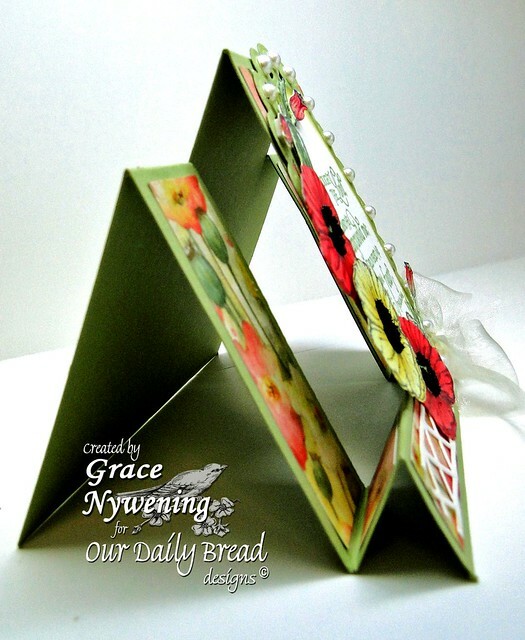 Grace your center step card is STUNNING! I love everything about. Thanks for sharing. I've seen your entry from Make It Monday link party. Thank you so much for the sweet comment you left in my blog. I truly appreciated. Hi Grace, saw your beautiful card on "Make it Monday" linky party and had to come over and leave you a comment. An inspiring verse as well and the poppies are gorgeous. Oh Grace, this is stunning!! I just love your stair step design and your bright poppies. Gorgeous coloring and design!! this is stunning Grace. Love the dimension and vivid coloring on the flowers. Amazing! Love the poppies and the background paper too! GASP! Gorgeous design and coloring, Grace! Love the poppy arrangement and the vibrancy of the design! STUNNING! Have a Blessed Easter Weekend! Grace - your card is beautiful!